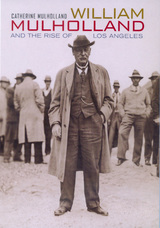 Of those civil servants who helped develop the modern metropolis of Los Angeles in the early twentieth century, the most prominent was William Mulholland (1855-1935). For over forty years spanning the administrations of nineteen mayors, Mulholland was a central force in the creation of a municipally owned water and power system that allowed a small, otiose western outpost to swell to outsized proportions. As a self-taught and inventive engineer, he became the creator of a project that ranked in magnitude and daring with the Panama Canal. A pen-and-ink cartoon of Mulholland drawn in 1902, about the time the City of Los Angeles had at last regained control of its domestic water supply from the private company to which it had foolishly leased its pueblo water rights thirty years earlier, portrays a sturdy man in work clothes planted in front of a pump and water trough with two buckets labeled "City Water" at his feet. By then; Mulholland had worked for that private company for twenty-four years, having advanced from anonymous ditch tender in 1878 to superintendent of the works in 1886, a position he continued to hold under the new municipal management. "When the city bought back its water, it bought me too," he later remarked. The authority of his stance and stern gaze leaves no doubt that he is indeed the keeper of the well, and at the height of his power and vigor, he was exactly that: the overseer and caretaker of water for Los Angeles. He brought fame (and some say ignominy) to the City of Los Angeles when, in 1913, as chief engineer of the great Owens River Aqueduct, he delivered to the city from 233 miles away its first abundant water supply. When the University of California at Berkeley honored him with an honorary doctorate degree the following year, the inscription on the diploma read, "Percussit saxa et duxit flumina ad terram sitientum" (He broke the rocks and brought the river to the thirsty land). Upon the aqueduct's completion—after years of struggle and heroic labor to create this engineering marvel—Mulholland stood amidst the cheers of the crowd, and over the roar of the waters cascading down the spillway north of San Fernando, he uttered briefly and memorably, "There it is. Take it." Not only did that moment become legendary in the city's modern history, but it also created a controversy that has never died. When Life magazine's fall 1990 special issue included Mulholland among the one hundred people who had most influenced American history in the twentieth century ("The engineer moved a river and made the desert bloom. "), a New York journalist was quick to snipe, in an amusing instance of East Coast parochialism, that Mulholland's presence on the list seemed "a bit strained" and that it probably constituted "a sop to the hinterlands." Mulholland was to live amid political conflict and controversy into his seventies. Then while he was actively planning and campaigning for the expansion of the city's water supply from the Colorado River, a dam that he had approved failed and killed over four hundred people, thus drowning his career in the wake of the worst man-made disaster in California's history. This saga deserves renewed scrutiny, as in recent years the popular media, relying upon old rumors and hearsay, have increasingly presented this water story as a tabloid yarn of water thievery and crooked land deals. One fictional and melodramatic movie, Chinatown (1979), has come to be regarded by the uninformed as a kind of documentary work on the history of Los Angeles, while others who hold the city in disdain see the film as a clever parable on the greed and ambition of an upstart town. In a May 1, 1991, article on city water systems, the New York Times saw fit to cite Los Angeles as a horrible example of overexploitation of resources. To substantiate its case, the Times egregiously cited Chinatown as the work "which chronicles how the city seized control" of water to which it had no right. Three years after Mulholland's death, newspaperman John Russell McCarthy wrote of him, "He had little pity, much strength, great ambition. There is no one else in sight, past or present, whom Los Angeles is more likely to remember." And so, loved or hated, Mulholland remains important to the history of Los Angeles and Southern California, his status recalling historian Carl Becker's evaluation of Martin Luther: "The Protestant may love Luther, the Catholic may hate him, but they would agree that Luther is important for the Reformation." Whether cherished or reviled, Mulholland endures at least as a potent figure in the history of his adopted city. William Mulholland was a fine-featured, handsome man, who, although a shade under six feet, always gave the impression of being taller because of his straight-backed, commanding presence and the penetrating gaze of his blue eyes. He had enormous energy, got by on little sleep, and remained vigorous until the Saint Francis Dam disaster eroded his spirit and health. His greatest assets—and doubtless a key to his success in public life—were a ready wit and an ability to get along with men. Mulholland's private life seldom impinged upon his public affairs. In 1890, at the age of thirty-five, he married Lillie Ferguson, then twenty-one. They remained devoted and compatible until the home-loving and retiring Lillie died of cancer in 1915. She bore seven children, five of whom survived to adulthood. The oldest, Rose Ellen (1891-1977), kept house for her father until his death, and although his domestic life amid children, relatives, and in-laws was sometimes turbulent, it rarely distracted him from work. His second daughter, Lucile (1896-1968), expressed it best when asked about her father at the time of the aqueduct's completion. "Father?" she laughed. "You mean that man who sometimes eats dinner with us." The city's growth and change, which Mulholland had helped to create, also destroyed most of the landmarks of his private life. By the 1960s, his former family dwellings had disappeared, as had the ranch in the San Fernando Valley whose land he had purchased and which his oldest son, Perry (1892-1962), had cultivated. The Boyle Heights home at Sixth and Cummings, where the family had lived from 1894 to 1920, was bulldozed to make way for the Santa Ana Freeway, while his later home at 426 South Saint Andrews Place was razed for an apartment building. At the end of the twentieth century, the only habitation that remains is the house of his nineteenth-century childhood in Dublin, Ireland. Mulholland was the second son of Hugh and Ellen (Deakers) Mulholland, born in Belfast, Ireland, on September 11, 1855. Although Mulholland's parents were Dubliners, his father, a mail guard, was stationed in the north when the first three children were born: Thomas (1853) and William (1855) in Belfast, Hugh Patrick (1856) in Derry. By 1860, the family had settled permanently in Dublin, five years after the end of the Great Famine, which had left Ireland a dispirited and depleted land. Mulholland later displayed little nostalgia for his native land, and when asked at the height of his career if he would not like to take a trip back to the old country, he snapped that he never wanted to see the "damned island" again. His parents were of the newly emerging Catholic lower middle class, which had been pushed off the tenant farms of their ancestors and crowded into the cities. Since the early eighteenth century, Mulhollands had lived in northeastern Ireland, midway between Belfast and Dublin in Counties Meath and Louth, tenant farmers on the vast lands of the viscount Massarene. William's grandfather Patrick Mulholland had been born in 1798, the year of the French invasion of Ireland; his father, Hugh, born in 1827, came into the world during the first of the horrific famines that afflicted Ireland for the next forty years. Because an Irishman then was allowed to vote only if he had twenty acres, and because Patrick, a farmer in Colinbeg, had ended up through inheritance with only seven acres and a house, he and his sons were disenfranchised. Hugh, as the seventh and youngest son of a man who owned only seven acres, was at best without great expectations, and therefore had to cast about for a means of survival. Lord Massarene required his tenants to serve in the militia (Home Guard), and if a young man demonstrated ability and dependability he could advance to the position of a guard on the coaches that Massarene ran between Derry and Dublin. By this process, Hugh Mulholland worked his way into a position as a mail guard with the Royal British Mail. As there was no civil service until 1855, the only way to attain such employment was by nomination. Once nominated, one was assured of serving for the rest of one's life. In his later public life, William Mulholland tended to couch his father's employment in general terms: "connected with the Government mail," he would say, as if he perceived something infra dig about his father's work. Yet in those desperate days in Ireland, a guard job with the Royal Mail would have been a coveted post that offered a good living and some prestige, the term royal being not meaningless in Victorian Ireland. Long waiting lists were customary for this position, which demanded that a man be under thirty years of age and that he must pass a test on the three R's. That Hugh qualified for such a post also indicates his literacy, which was not to be assumed in his era, when 47 percent of persons ages five and up in Ireland could neither read nor write. A famous superintendent of mail coaches, Thomas Hasker, kept a voluminous record of his career and was said to have loved his guards as a great commander loves his soldiers; indeed, in the entire development of the Royal Mail service, the key men were the mail guards. "Everything depended on their integrity," Hasker wrote, "their loyalty, their tireless zeal in the discharge of their very arduous duties, their hardihood of body as well as of mind." These same admirable qualities that enabled Hugh Mulholland to survive and prosper in Victorian Ireland also produced in him a rectitude and hardness of character that ultimately drove two of his sons a world away. Cherchez le pére may well be the watchword for the character of William Mulholland, as an interesting parallel suggests itself between a father and son who each, in different times and worlds apart, demonstrated similar abilities and behaviors as trusted employees of public agencies. In old age, Mulholland told certain questioners that he had no recollection of his mother, who had died when he was seven, but to his children he sometimes spoke of her, remembering that her wit, lively nature, and love of song had been an antidote to his father's grim seriousness. A monument to this bright-spirited young woman stands in Glasnevin, the famous Dublin Catholic cemetery built under the direction of the great emancipator, Daniel O'Connell, and immortalized by James Joyce in the Hades episode of Ulysses. Inscribed on the granite stele are the words "Erected by Hugh Mulholland in memory of his beloved wife—Ellen. Aged 28 years who died 18th September, 1862." Grave records further reveal that also buried in the plot with her are two infant daughters, six other members of the extended family, and later, Hugh. Ellen Deakers had been to America as a girl before she returned to Ireland to marry Hugh Mulholland. Family lore has it that she grew so homesick for Ireland (and Hugh) that her father allowed her to return. Although no record has been found, their marriage occurred sometime between 1850 and 1852. Ellen's brother, Richard Deakers, Jr., however, remained in America and prospered in his father's draper's business in Pittsburgh during and after the Civil War. Because of Richard, two of Ellen's sons, William and Hugh Patrick Mulholland, would one day find their way to Pittsburgh and ultimately to California. Sickness and death pervaded Willie Mulholland's childhood home. Consumption took two baby girls and then Ellen herself shortly after the birth of a sixth child, leaving Hugh, at thirty-three, a widower with four motherless boys, the youngest an infant of a few months and the oldest not yet ten. The impact of these losses upon the seven-year-old Willie is unknowable. On the evidence, he must simply have repressed much of what he felt and turned to his brothers and schoolmates for whatever companionship and warmth they could offer. His propensity for male friendships must have derived from that time when he lost the women of his family and, given the male-dominated Victorian world he lived in, perhaps concluded that it was safer to invest his time in those who did not seem to go under so easily. At the time of their mother's death, the oldest boys, Thomas and Willie, were in their second year at the O'Connell School run by the Christian Brothers on North Richmond Street, only a short walk from their home. Today the Christian Brothers Schools are honored for playing a leading role in the Irish Revival and are recognized for providing elite training to the urban poor of nineteenth-century Ireland. A chief justice of Ireland who attended during the same years as the Mulholland boys later wrote that "the school course contained comparatively few subjects, but they were well and efficiently taught." Willie left the O'Connell School before completing the full course of instruction, but while there he worked through three readers, four levels of grammar, four of geography, and being most advanced in arithmetic, had achieved six levels by the time he left the school. The reasons for his leaving are not clear and are certainly murkier than those of James Joyce, who, a generation later, attended the same school—and was ashamed to admit it—as his devotion to the Jesuits was so powerful that he considered the Christian Brothers mere drones by comparison. "Paddy Stink and Mickey Mud," his class-conscious father, John Joyce, had dubbed two teachers there. Willie's chief memory (at least, the one he chose to tell his own children) was of the day, when almost ten, he joined his schoolmates at a special school assembly and heard the father superior tell them that a terrible tragedy had just befallen the world. In America, President Abraham Lincoln had been assassinated and they must all bow heads and pray for his soul. Of greater immediate impact on young Willie than Lincoln's death, however, was the arrival of a stepmother. In 1865, after three years as a widower, thirty-six-year-old Hugh married Jane Smith, aged thirty, in Drogheda, where her sisters lived, wives of sea captains. By all accounts, Jane Smith tried to be a good mother to her stepsons, but as she herself was pregnant the next year with her first child (a daughter, Mary, born in 1867), followed by two sons (Joseph, 1869, and Michael, 1871), her attention never could have been fully focused upon the lively older boys, who were out of the house at school during the day and accustomed to a degree of independence. Tom, the oldest, eventually became a conforming son who followed his father into the postal service and at the time of his death from consumption at thirty-eight in 1891 was still unmarried and living at home with his widowed stepmother. Willie and Hugh Patrick, however, were another story. Only eleven months apart, they were almost like twins in their closeness, although family members who recalled them in later years always spoke of Willie as if he were much older and more dominating than Hugh. Described as "a pair of Dublin jackeens"—city kids who ran the streets with their buddies—they became the rebels of the family. At fourteen, Willie ran off to sea for the first time after a severe beating from his father because of bad marks at school (by then he probably was attending a national school, although all records are lost). He returned home and after a brief period of study entered the British Merchant Marine at fifteen. The following year, the father enrolled Hugh Patrick, then also fifteen, into the British Navy. FOUR YEARS BEFORE THE MAST AND WESTWARD HO! Although much of Dublin in the 1860s was decrepit, life on the waterfront was energetic and vital, with its port being developed into one of the best-run harbors in Europe. Between 1860 and 1914, over 38 million tons of debris were dredged from the Liffey, while docks, berths, and the new Alexandra Basin were added to the existing facilities. Irishmen such as John Wigham were pioneers in introducing gaslight to lighthouses and illuminating buoys. The famous Bailey light with its 9,000 candlepower, revolving lens, and gaslight that produced flashes in groups became the model on all the world's coasts. These matters, rather than Latin declensions or the Celtic Revival, were what excited the imagination of Willie Mulholland. Although surrounded by political tension and unrest (the 1860s saw the rise of the Sinn Fein movement), he dreamed of neither academic achievement nor Irish independence but rather of going to sea at a moment in the nineteenth century when, with the supremacy and protection of the Royal Navy, Britain possessed the largest merchant fleet in the world. After four years at sea, Willie would later enliven many a night circle in California construction camps and in the high Sierras with his tales of seafaring days on a three-masted, full-rigged merchantman, the Gleniffer. Those yarns have vanished with the smoke of the long-dead campfires, and only meager accounts remain of his nineteen Atlantic crossings to various ports in North America and the West Indies and his eventual promotion to navigating officer of the vessel. Life at sea initially must have suited the young and enthusiastic Mulholland. Freed from the strictures of family, church, and a crowded household, he did not find the cramped confines of ship life as punishing as might a youth from a more solitary or privileged environment. By now, he had developed a propensity for inner solitude that he would retain for the rest of his life. Long before Joyce had articulated his youthful intention of employing "silence, exile, and cunning," Willie Mulholland, without saying so, had pursued such a course. He retained a lifelong love of the sea but at the end of four years concluded the sailor's life "would get him nowhere in a material way." After sailing into New York City on June 9, 1874, Willie returned to shore with a sense of pride in having survived the nautical experience and in having deepened his understanding of life and men amid the motley crews of the fo'c'sle. In his first summer in America, Willie found work on a vessel in the Great Lakes and later cherished the memory of its Irish captain, who noticed him on deck one night as he stood at the rail and whistled a tune. Remarking that he had not heard that air since leaving Ireland, the captain made friendly talk with his young crewman, who would always remember how the encounter had eased his loneliness in a strange land. In the winter of 1874-75, Mulholland worked in a lumber camp in Manistee, Michigan, where a logging accident altered his life and left him permanently appalled by the reckless deforestation he had witnessed. The mishap landed him in a camp hospital with an injured leg that developed erysipelas (a streptococcal infection). From his bed, he overheard doctors mention gangrene and the probable need to amputate the limb, so he bolted and somehow made his way to Cincinnati. There, at the age of twenty, weak and barely alive from his recent illness, having only a few dollars left and too proud to let any of his family know of his plight, he reached the lowest point of his young life. "Why bother?" he wondered. Ahead he saw nothing but endless years of grinding work with no reward. As he wandered the streets in this hopeless state, he suddenly heard a choir of clear-voiced boy sopranos singing the Gloria in Excelsis in a nearby church and felt a surge of hope and renewed courage. He entered the church and spent an hour in prayer and meditation as the suicidal mood passed and his zest for life returned. Willie next became attached to an itinerant mechanic with a team, who drove through the country sharpening scissors and repairing clocks. He later told his daughter, Rose, that he grew so fond of the gypsy life that he had to force himself to give it up and follow the urge to do something worthwhile with his life. During Willie's Wanderjahr, Hugh Patrick, having learned that his brother had left the sea, followed suit and upon reaching American shores jumped ship. As one of the family later explained his desertion from the British Navy, "Hugh got over into some American port, and he ejected himself." Somehow the brothers found each other and made their way to the Pittsburgh home of their American uncle, Richard Deakers, who never forgot the day in the autumn of 1875 when Willie and Hugh "just showed up on the doorstep." The Mulholland boys had landed on a prosperous threshold, for the Deakers family in all ways qualified as "lace curtain Irish," living as they did in the Hazelwood section of Pittsburgh in a pleasant home with a cook and servants. Uncle Richard was well established as a Pittsburgh dry goods merchant and husband of Catherine Thorpe, a native of Ireland, who, by all accounts, was the abiding genius of the family business. Her few surviving letters indicate that she was a highly competent lady concerned with maintaining order, proprieties, and good appearances. Devout Catholics, she and Richard had eight children, and they now charitably welcomed their two stray nephews from Ireland. For almost two years, cousins Willie and Hugh stayed at the Deakers home and worked at their uncle's dry goods store. Events took an ominous turn, however, when another relative remembered only as "Uncle Hobson" showed up on the Deakers doorstep carrying tuberculosis. Soon some of the Deakers children were presenting symptoms of the disease, and by 1875 two had died. As three of Catherine's brothers had been ranching in San Diego County since 1868, the family made the wrenching decision to leave the city where they were so well established and join the throng of health-seekers who had begun crowding into certain areas of California to the extent that historian Hubert Howe Bancroft worried that they had introduced a weakness into "our exceptionally youthful and hardy community by an increasing proportion of delicate women and children." The journey was a disaster. While Richard stayed behind to close business, the other Deakerses followed medical advice that the Panama or Horn routes were best during the cold months and booked passage on a large, three-decked vessel, the Crescent City of Liverpool, which sailed out of New York Harbor on December 9, 1876. Its passengers included not only Catherine Deakers, her six surviving children, and Uncle Hobson, but two stowaways, Willie and Hugh Mulholland. Shortly before reaching Colón, however, the pair were caught and dumped at the Isthmus of Panama. Probably because they lacked the twenty-five dollars in gold to pay for the train ride to Balboa, they were forced to hike the forty-seven miles across the isthmus. (As an old man Mulholland rather grandly glossed this over, once declaring, "I would walk that far today to make twenty-five dollars.") Once on the west side, they signed on to a Peruvian man-of-war headed for Acapulco. From there they found another ship that took them to San Francisco. Ashore, they bought two horses and made their way southward to find the Deakers family in Los Angeles. When at last they reached the pueblo, they learned that the voyage had continued to be ill-fated for their Aunt Catherine. Two more of her children, already weak with consumption, contracted typhoid and died on shipboard. When the ship from Panama had finally made port at Santa Monica, one of the younger Deakers children, fourteen-year-old Ella, looked about, caught her first glimpse of Los Angeles, and was aghast. It was, she later said, a place "where nothing looked like anything." Copyright © 2000 the Regents of the University of California. All rights reserved. Catherine Mulholland, the engineer's granddaughter, provides insights into this story that family familiarity affords, and adds to our historical understanding with extensive primary research in sources such as Mulholland's recently uncovered office files, newspapers, and Department of Water and Power archives. She scrutinizes Mulholland's life—from his childhood in Ireland to his triumphant completion of the Owens Valley Aqueduct to the tragedy that ended his career. This vivid portrait of a rich chapter in the history of Los Angeles is enhanced with a generous selection of previously unpublished photographs. Catherine Mulholland is author of Calabasas Girls: An Intimate History (1976) and The Owensmouth Baby: The Making of a San Fernando Town (1987).